Figure 5.12: Albedo is a measure of reflectivity of a surface or body. Image from the National Snow and Ice Data Center. Check Your Thinking: How does the capacity of snow and ice to reflect sunlight impact the Earth’s energy budget? Albedo is a measurement that indicates the amount of reflection of solar radiation by an object. Latin comes into play again here. Albus is Latin for white, which you will recognize from the English word albino. The gases in the atmosphere, clouds (water vapor), and particles suspended in the atmosphere combine to reflect about 26% of the incoming solar radiation. Check Your Thinking: What parts of the Earth’s systems can reflect solar radiation back into space? Optional: For details on the role of the atmosphere in reflecting sunlight, see Atmospheric Effects on Incoming Solar Radiation from PhysicalGeography.net. For lots of great information on other things that go on in the atmosphere (ozone layer, greenhouse effect, etc.) take a look at Project Learn: Cycles of the Earth and Atmosphere. The Earth as a whole has an albedo of roughly 0.3 to 0.4. It is the ratio of electromagnetic radiation (EM radiation) reflected to the amount incident upon it. The fraction, usually expressed as a percentage from 0% to 100% (or as a dimensionless value between 0 and 1), is an important concept in climatology and astronomy. A perfect absorber does not reflect any of the sunlight that strikes it. It looks black and has an albedo of 0. When an object absorbs most of the light that hits it, it looks dark and has a low albedo. A perfect reflector reflects all the sunlight that strikes it. It looks white and has an albedo of 1. Objects that reflect most of the light that hit them appear bright and have a high albedo. Figure 5.13: A new sensor aboard NASA’s Terra satellite is now collecting the most detailed and accurate measurements ever made of how much sunlight the Earth’s surface reflects back up into the atmosphere. For a simulation that shows variations in albedo at different locations and in different months, visit Earth’s Albedo from Meteorology: Understanding the Atmosphere. In that simulation, note that the darker colors represent areas with low albedo (low reflectivity, high absorption), light colors represent areas with high albedo (high reflectivity). Can you answer the questions on that website? The area off the west coast of South America has a high albedo because the clouds are reflecting the sunlight. Greenland has a high albedo because the snow and ice are reflecting the sunlight. There is an important interaction that occurs between global temperatures and the amount of snow and ice. Check Your Thinking: What do you think happens to the amounts of snow and ice on the Earth if the global temperature increases slightly? Check Your Thinking: If there is less snow and ice, what do you think happens to the temperature of the Earth? Check Your Thinking: What causes this to occur? This type of interaction is known as a feedback loop. One factor (e.g, rise in temperature) causes a change in the other factor (melting of snow and ice), which in turn causes a change in the first factor (rise in temperature), and so on. If the water and the land become warmer, then there is less snow and ice. If there is less snow and ice, both the water and the land become warmer. What is often called the ice-albedo feedback loop, once started, can continue to exacerbate itself, unless something happens to reverse or mitigate the cycle. It is important to recognize the effect that increases in global temperatures are already having on snow worldwide. 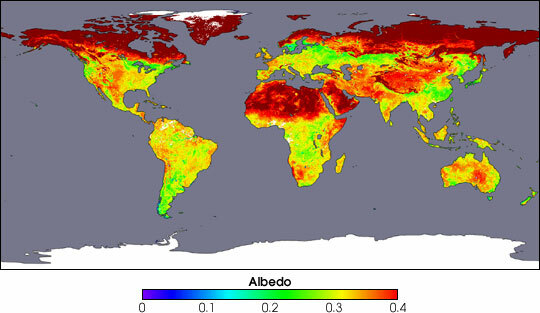 Optional: For more information on albedo, see Earth’s Albedo in Decline from the NASA Earth Observatory. You can also download Earth’s Albedo and Global Warming, a module from TeachersDomain.org that includes some simulations.